Making a small home seem larger isn't so difficult. In fact, using some simple tips and tricks in planning the layout of the furniture and accessories in a home, as well as adding some essential storage areas that blend in well with the décor, will make your home seem a lot more spacious and uncluttered. The illusion cast by open spaces in a room just makes it seem bigger! Use the right colour palette and tones with simple lighting and perfectly placed furniture that highlight the space available correctly. Choosing the correct size furniture is also extremely important when decorating a smaller home. Include lighting that creates a brighter and more airy room, as opposed to a room that is less illuminated, which often looks more shaded and therefore appears smaller. The concept of open plan living is a newer take on the modern home, older houses regardless of shape usually have separate spaces for cooking, eating and relaxing. The home space is no longer just a place to live in after a day and work, the home is now a place to start a family and entertain family and friends. The open plan living space allow for the kitchen and living room space to merge and become a seamless room in its entirety, calling for decor to be similar throughout the area. The colour palette and tone used here are therefore creating that wide and open space. The lighter colour used on the floor and in the furniture and kitchen island looks minimalist, modern and uncluttered, while at the same tome looking airy and adequately lit. 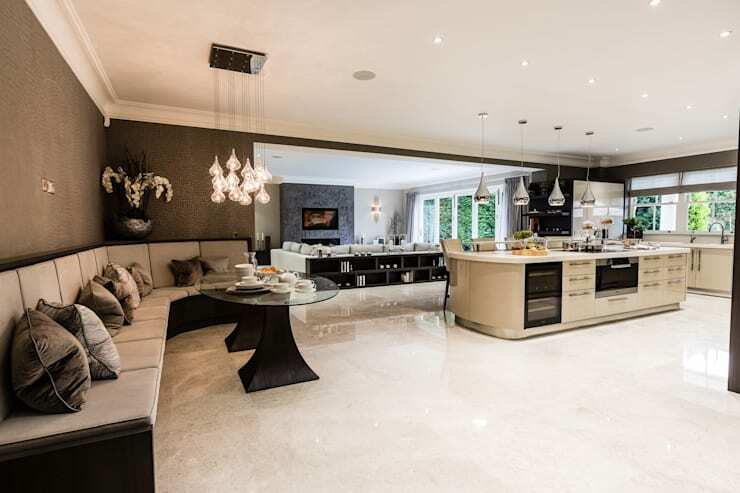 The polished flooring further accentuates the lighter and brighter design of this home. This glass wall provides a perfect view to the beautifully green outdoor environment. 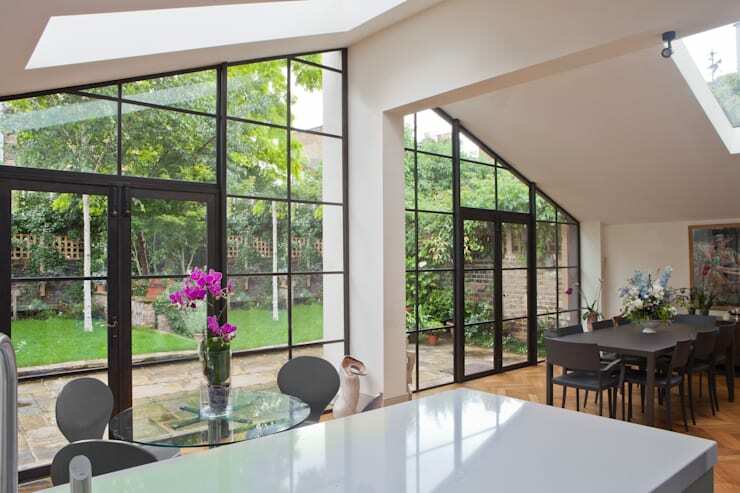 This natural sunlight inducing part of a home enables the space with a brighter appearance, allowing for fresh air to enter into the home through these large rustic looking windows. This uncluttered room takes in the outdoors and provides an illusion that it is part of the room, especially through the floor to ceiling windows that so elegantly allows light to become an essential part of this room throughout the day. If you aren't blessed with a window wall in your home, but would still like to create the illusion of a bigger space through use of the windows, then perhaps consider not putting up draped curtains and allowing the light to shine in, and if you are concerned about privacy adding Roman shades may just be an option for you to consider decorating your windows with. For more window décor inspiration, check out: 6 Tips to Dress Your Windows to Impress. The use of good lighting in making a home space seem bigger is clearly evident in the example of this attic which was so excellently designed by Brown + Brown Architects. 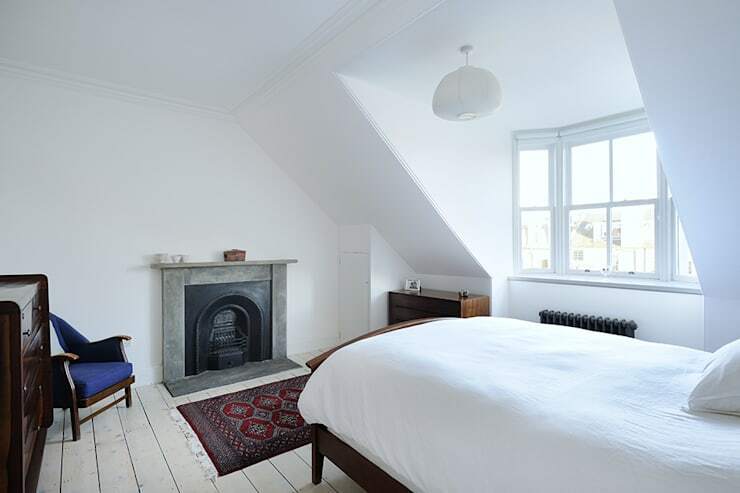 Being on the top level of the house allows the attic to be privy to an abundance of natural sunlight and the team has used that to their advantage. Using an all-white tone throughout the room allows it to seem bigger, which if further accentuated by the natural sunlight that pours through the window quite nicely, setting the tone for a warm, serene and welcoming space to enjoy. Good lighting is doubled up here as the all-white room is brightened even more through the neutral tone utilised throughout, making this room functional, elegant and seemingly larger than it actually is. Who would've thought simple colours can create this illusion? With some relaxed inspiration and well-placed lighting any room can become a haven. It's amazing how the simple use of lighter décor and a neutral palette included in the décor, furniture and flooring creates a clean, modern use of colour and minimalist style with natural exposed wooden features can create a room that is both bright and airy. While the white used in the décor of the well positioned double doors, the white walls and even white ceiling provides a seamless approach throughout the room, with matching white decorative lights and simple white lamp shades that will spread ambient light throughout the space during the evening. The classic and elegant use of simple furniture pieces all in a similar hue adds to this well decorated room without it looking cluttered and overdone. It certainly is a perfect blend of dining room and living room in a small yet breezy space, the room has even included some awesome storage through the shelves on the left! Using clever storage spaces is a tip or trick that most interior designers and architects like to think of, especially in homes that are smaller. But no home, no matter how big or small requires no extra storage space! It is the perfect way to keep an uncluttered home tidy, with everything having its place to be. Clever storage ideas can be used throughout a home, from carefully placed storage ottomans to keep those extra scatter pillows safe, a chest at the edge of a bed for those extra bed linens that you don't have space for in your cupboards or even a hidden compartment underneath an unassuming window seat. This storage space under the wooden bed is genius! 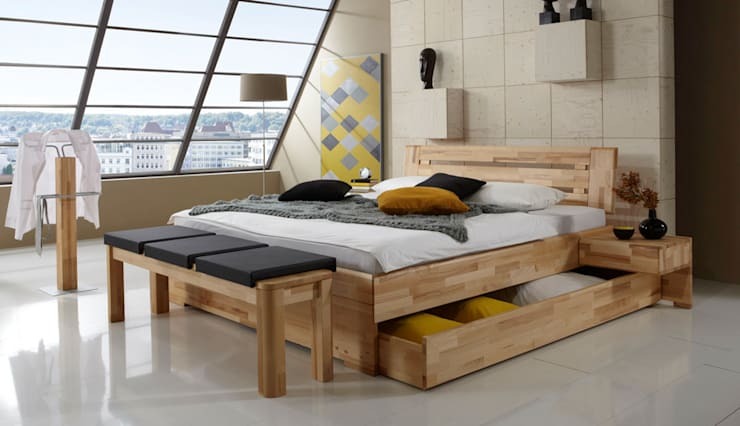 It allows for extra bed linen and pillows to be safely stowed away in an easy to reach place. And although sometimes it may take some time for find your perfect furniture piece with brilliant storage, the wait will be worth it once the item matches perfectly with the room. 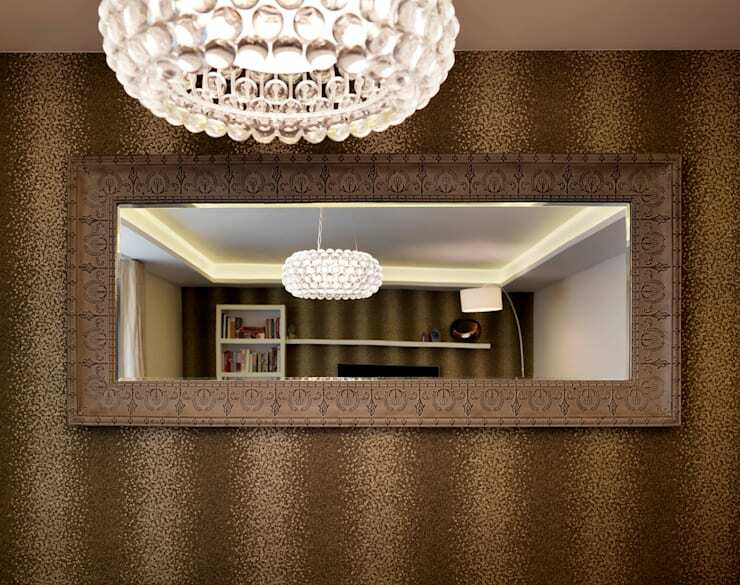 Using mirrors throughout a house doesn't only have to be as a means to check if your makeup, hair and outfit are coordinated, mirrors can also be used as a strategic means of creating an illusion of a larger room. This tip doesn't only have to be used in the bedroom or bathroom, it can certainly be incorporated throughout the home. Another trick to creating an illusion that a room is larger than it in fact is, is to place a mirror in front of a light as seen in the example. The brilliance of this fancy lighter is doubled! Making the room even brighter and thereby providing an illusion of more space and illumination at the same time. Quite smart! Alternatively, place the mirror in front of a mirror to further accentuate the natural sunlight that is pouring into the room throughout the day, this also makes the room seem larger as the light coming in from the window is reflected onto the mirror. Instantly adding brightness! Have you used any of these tips or tricks to make your home appear larger? Let us know!